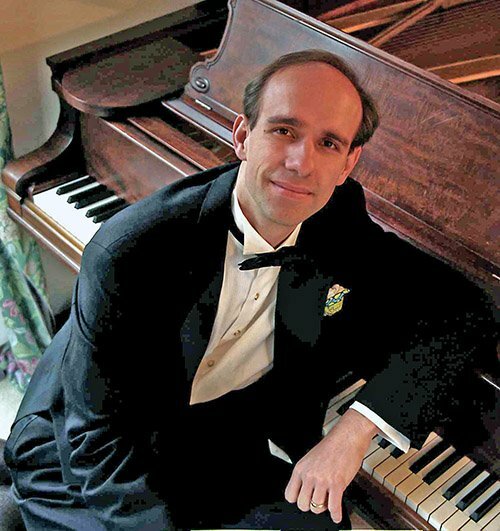 The remarkable pianist Christopher Taylor first came to my attention in, I think, 1989, when still a Harvard undergraduate. At a specialty concert in Paine Hall, a retrospective of Alban Berg’s contemporaries in connection with a Berg conference, he gave a wonderfully crisp rendition of Stravinsky’s quirky Piano-Rag-music, the first time any pianist made sense out of it for me since I’d heard Paul Jacobs play it at Tanglewood 30 years earlier. Now in his late 40s, Taylor possesses a repertoire that mixes the seldom heard or semi-standard with massive moderns. He is an intellectual pianist with superb technique and superb sensibility, like Marc-André Hamelin; he isn’t a matinee-idol who goes after big-warhorse audiences. Nevertheless, last night Pickman Hall at he nearly filled the Longy School, for the Gessner-Schocken concert series. The halves of the program had a dual theme: Beethoven’s Seventh Symphony before, Musical Moments after. John Corigliano’s Fantasia on an Ostinato (1985) is an eight-minute work loosely based on the A-minor rhythmic-chordal theme from the slow movement of Beethoven’s Seventh. It tosses fragments of that famous theme, from high-register A minor to low-register A major, all over the piano, in assorted discontinuous gestures, with a G-sharp right hand drip like a distant bell (compare Ravel’s Le gibet) and polychordal toccata bursts and throbbing minimalist patterns, from ppp to fff, with the randomly annoying frequency that I have always perceived in Corigliano’s work. But Taylor’s admirably expressivity did much to reassure me about occasional moments of subtlety in the piece, such as the restored G-sharp drip near the end, which, whether the composer intended it or not, could have been inspired by the repeated notes in the second theme of the first movement of Beethoven’s Appassionata Sonata. It was in the second half of this piece especially that Taylor’s sensitive tone commanded the listener’s attention. Liszt arranged Beethoven’s symphonies for solo piano, and the Ninth for two pianos as well. (Tufts faculty member Thomas Stumpf played the solo version of the Ninth a few weeks ago.) What is remarkable is not that it makes the piano sound like an orchestra but that the reduction really sounds like piano music — on a grand scale, but pianistic nevertheless. The reduction to a texture like that of a short score is more or less straightforward, although one would think it more manageable by two pianists. There are relatively few places where Liszt calls for tremolandos and arpeggios to increase the massiveness of sound, and it’s obvious that a piano with longer strings and iron frame served the sonority better than most of the pianos available to Liszt when he started, in the 1840s. A few peculiarities, as in the D-major Assai meno presto trio section of the Scherzo, where the familiar woodwind textures and sustained trumpet A appeared an octave lower. But this didn’t vitiate the conviction of Taylor’s solo performance, which was heroic throughout. He fought the instrument all the way, but it was a fair fight; only occasionally did one feel that it was a struggle for drama. He stumbled once or twice, but recovered instantaneously in recalling the exact manual configuration of a massive chord. The way this version of a symphony that everyone knows and loves could best succeed is with dancelike lightness and momentum, and Taylor managed that feature completely, with unfailing and often effortless energy. Schubert’s six Momens musicals, as they were published in 1828 (D.798), are all short, but one wouldn’t call them miniatures, except perhaps no. 3, the most famous (published separately in 1823, as “Air russe”). They are nonetheless characteristically melodic, combining the lyric with the dramatic, and played even by amateurs. Taylor’s tone was perfectly cantabile and suited to their intimate character. No. 2, in A-flat major, 9/8 with dotted rhythm, features fine detachment and pathos; the sound here was especially beautiful, but I wish Taylor hadn’t hurried the second third of the measure; it ought to be metronomically precise without seeming rigid. No. 6 is the most otherworldly of the six, with an appoggiatura motif throughout the outer sections, alternating or blending major and minor modes. (It too was published separately, in 1824, as Plaintes d’un troubadour a title that surely wasn’t Schubert’s.) I haven’t heard such a comfortable performance of all six of these beauties since the old recording by Schnabel. The title of Rachmaninoff’s six Moments musicaux may well have been inspired by Schubert’s, but they are in no way like his; they resemble more Chopin’s nocturnes on the one hand and etudes on the other. Averaging three minutes, they are, like so many of Rachmaninoff’s piano solos in which the pianism is central, excessive, with more notes and filigree than necessary. (Stravinsky wrote in 1959 that Rachmaninoff’s early piano compositions were “watercolors … freshly influenced by Tchaikovsky. Then at 25 he turned to ‘oils’ and became a very old composer indeed.” But Stravinsky didn’t understand Chopin either.) These Moments are big, and their big sound always persuades even when it submerges the melody. Taylor gave them total concentration and the result was invariably exciting. No. 4, Presto in E Minor, could have been marked furioso, the sound big enough to fill a cathedral. No. 5, Adagio sostenuto in D-flat Major, recalled several other pieces in the same key and mood: Chopin’s Nocturne Op. 27 No. 2 and Berceuse; Liszt’s Concert Etude No. 3 and Consolation No. 3; even the left hand etude by Scriabin (a Chopin-inspired classmate of Rachmaninoff’s; he won second prize in piano when Rachmaninoff won first). No. 6 was like Chopin’s Revolutionary Etude rewritten in C major and for both hands. Taylor tackled it explosively, stamping his left foot at the final chord. No other piano recital I’ve heard in the past three years has equaled this one for it combination of excitement, interest, and emotion. I hope Taylor will return early and often with whatever conventional or unconventional repertoire he wishes.